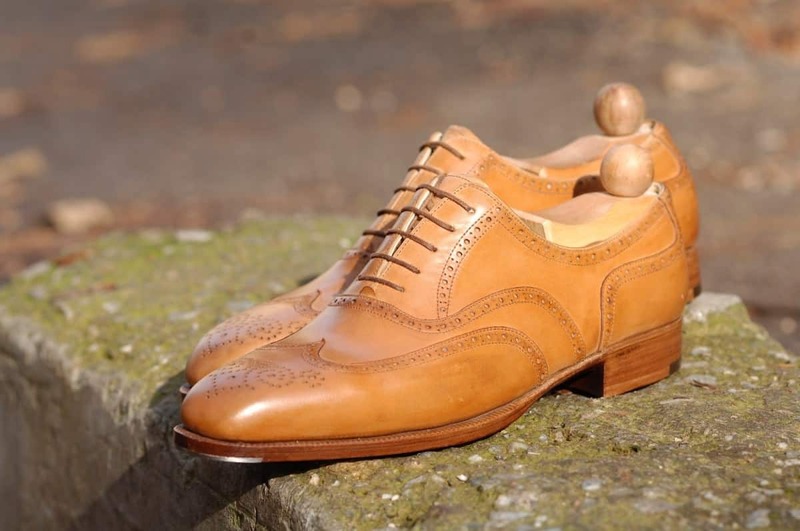 Today we are going to describe an extremely popular but often little understood shoe – the Brogue. The term brogue also refers to an Irish accent and is generally used to describe certain other regional accents from the United Kingdom, namely from Scotland and the English West Country. However, this is clearly not what we are talking about but interestingly this term is supposed to have its origins from the perception that the Irish spoke as if they had ‘a shoe in their mouths’. The Irish word brog means ‘a rough or stout shoe’. Clearly, brog or brogue was also used to denote shoes. To correctly understand what a Brogue is, one must comprehend the meaning of broguing. The Merriam–Webster dictionary describes broguing (brogue: ing – noun) as an ornamentation of shoes employing heavy perforations and pinking. 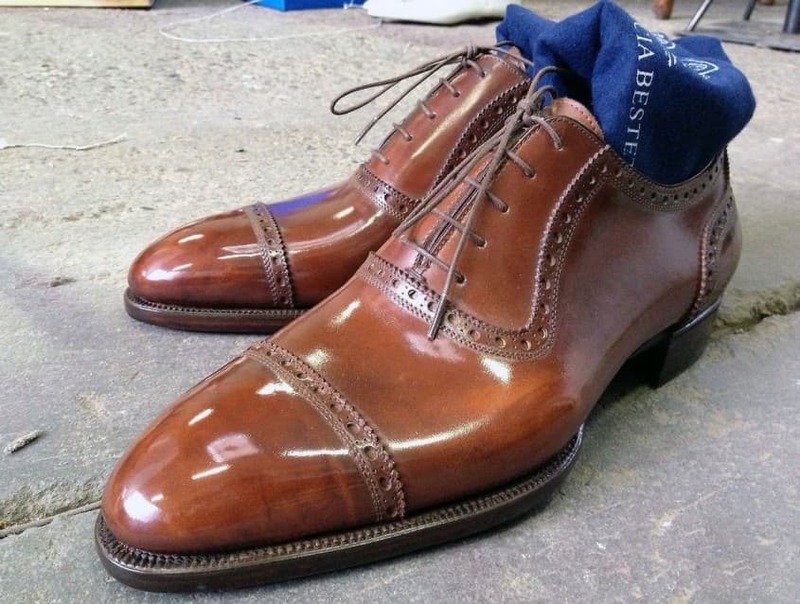 Therefore, it stands to reason that a shoe, any shoe, with perforations is a brogue – no matter if it is a Derby like the Budapester or Oxford shoes. Many people confuse the term Oxford with Brogue. 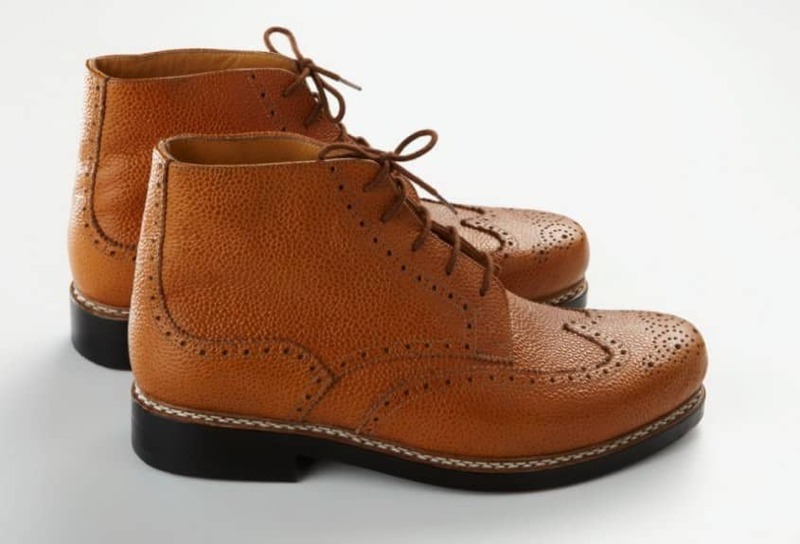 Of course, we use the term Oxford in the traditional sense, which is characteristized by its lacing system or to be specific: by the shoelace eyelets that are attached under the vamp. This is also called ‘closed lacing’. On the other hand, a Derby has ‘open lacing’ wherein the eyelets are attached to the top of the vamp. 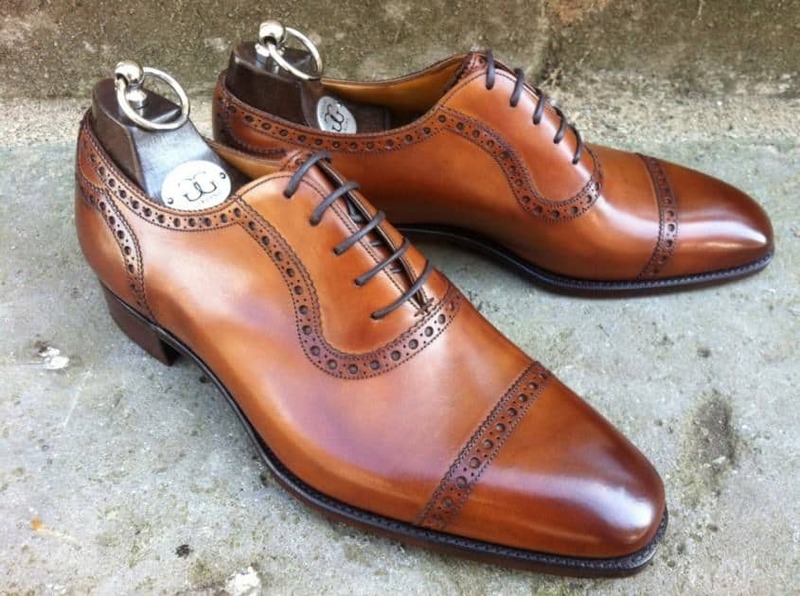 A detailed description of Oxford and Derby shoe is beyond the scope of this article, however suffice to say that while originally Oxfords were plain formal shoes, they subsequently evolved into a range of styles both formal and casual. Some of these styles feature broguing or perforations along the edges of the individual leather pieces and thus can be called Brogues. To sum it up: Oxfords are not always Brogues though they sometimes are and Brogues are not always Oxfords though some of them can be. It is the lacing system and the absence or presence of broguing that is the differentiating feature. 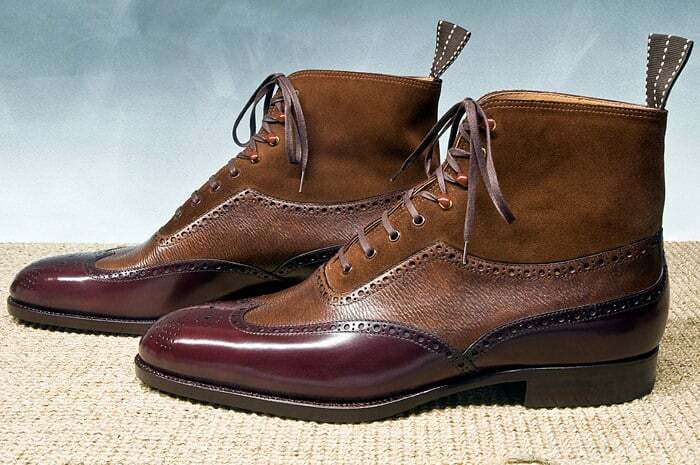 The Brogue was originally designed in Scotland and Ireland as a shoe suitable for wearing while working outdoors. The Irish and Scottish countryside is wet and characterized by bogs which made life very difficult for the people who worked there and, as was expected, their feet took a beating. 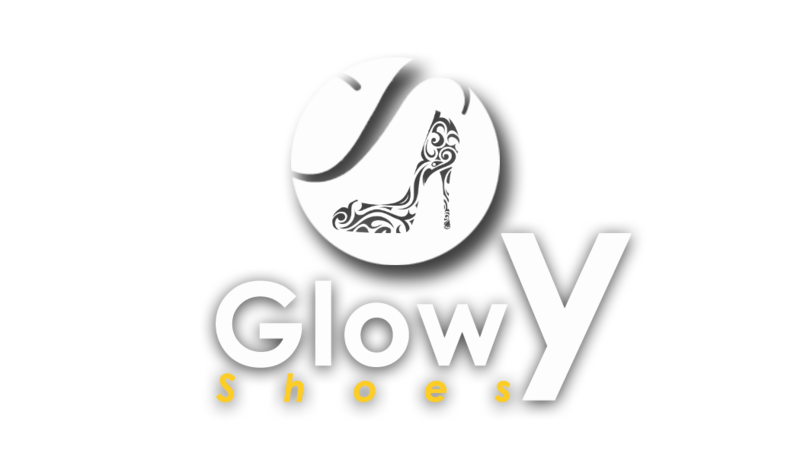 The need of the hour was a pair of shoes that were suitable for this type of work and terrain. The original Brogues were rudimentary shoes made with untanned animal hide; their distinctive feature was a series of perforations and serrations (broguing) of each piece of leather that was used in their construction. The purpose of these perforations was to allow water to drain from the shoes. Another feature of their design was that they were laced by leather tangs and did not have the tongue as in other shoes; they also had high lacing which wrapped above the ankles. This design feature kept the laces free from muck and dirt and prevented the shoes from being sucked off while walking in the mud. This basic design is now known as the ‘ghillie brogue’ and is often considered the standard style for traditional Scottish dress footwear. Presence of Broguing or (now) decorative perforations. 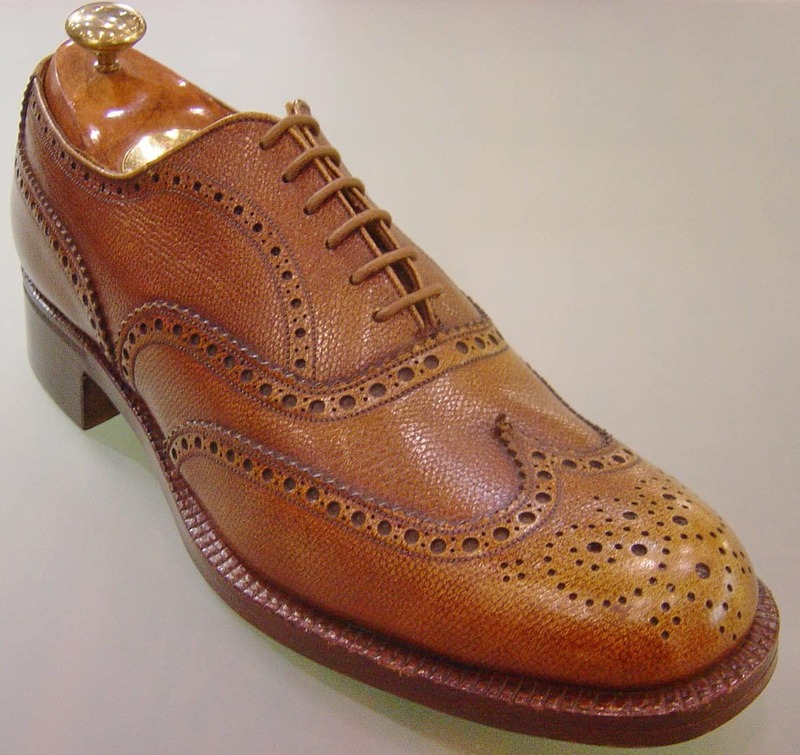 Various designs have evolved over time and so subcategories of brogues were created. 1. 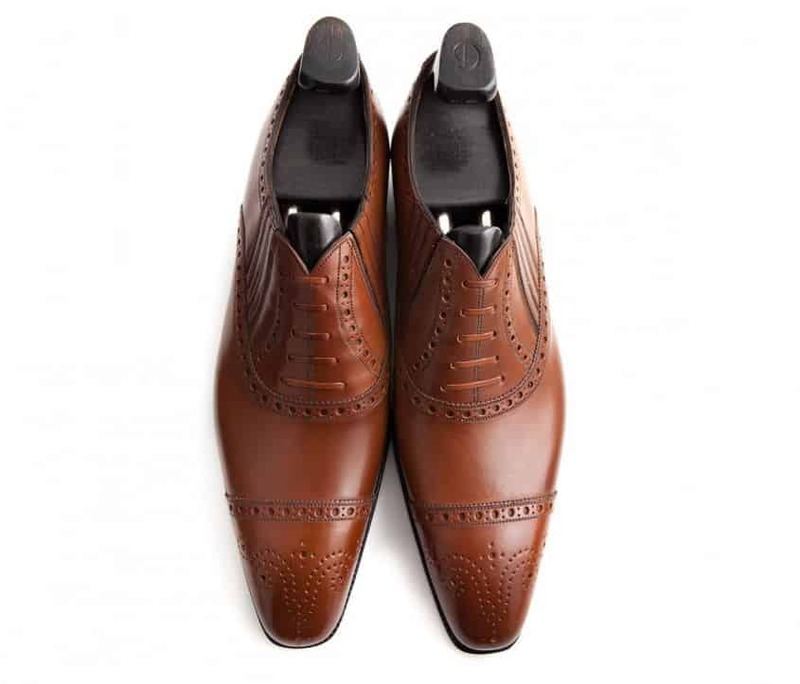 Full brogues or Wingtips – these have a pointed toe cap with extensions called wingtip which extends along both sides of the shoe and usually ends near the ball of the foot. When seen from above the cap is shaped like a ‘W’ or ‘M’ depending on the viewpoint. It features broguing along its edges as well as decorative broguing in the center of the toe cap, which is called Medallion. There are a few variations to this style. Wingtip toe cap with broguing only on the edges and without Medallion are called blind brogues. 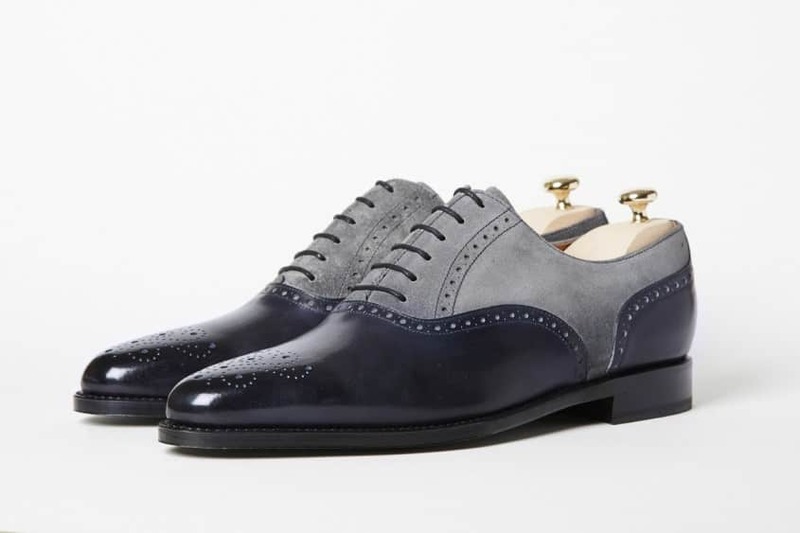 Spectator shoes are full brogues or wingtips in two contrasting colors. Usually the toe and heel caps and sometimes the lace panels are in a darker colour than the main body of the shoe. 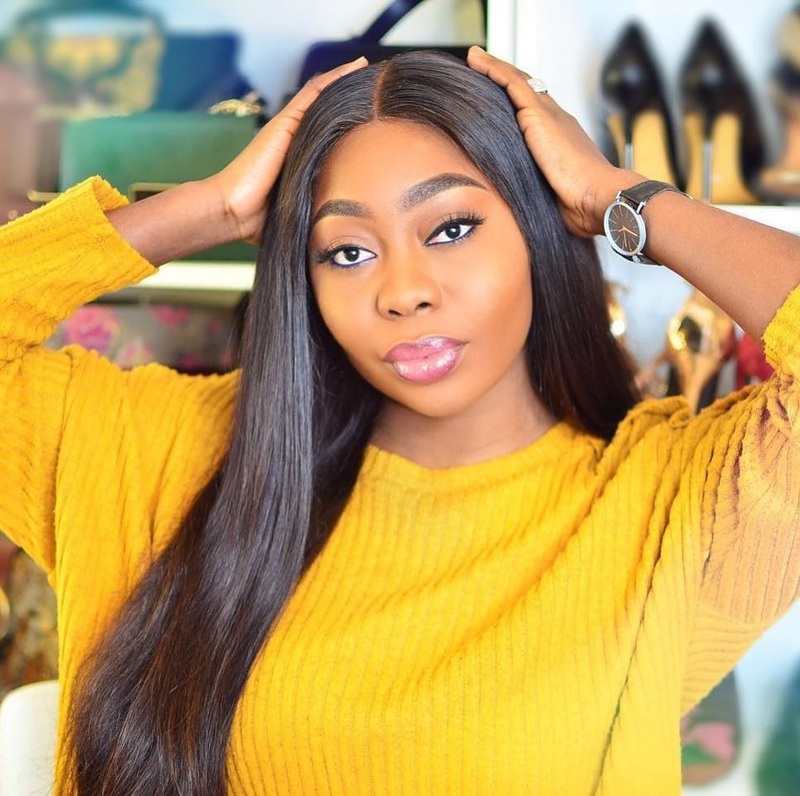 Typically the main body of the shoe is made of white or off white leather or canvas fabric but lately, all kinds of fabrics, colors, and textures have been utilized including tweed. 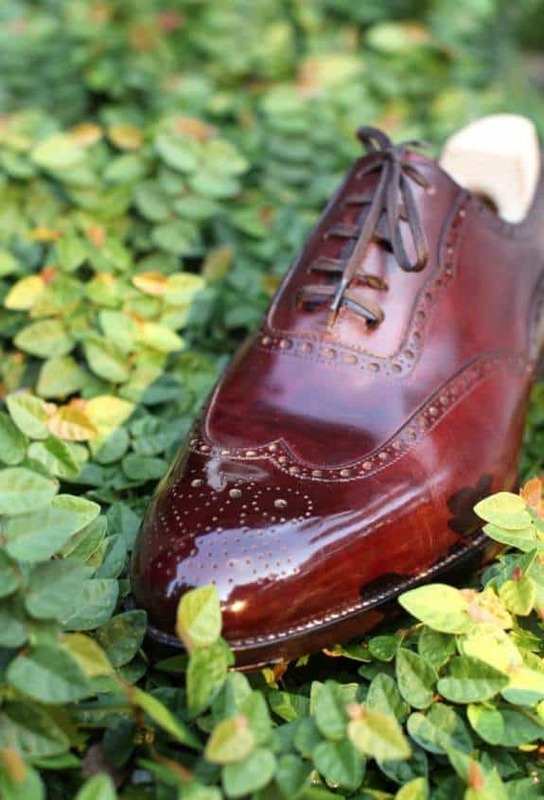 Longwing brogues differ from full brogues or wingtips in that the wings extend along the full length of the shoe and meet at a center seam at the heel. 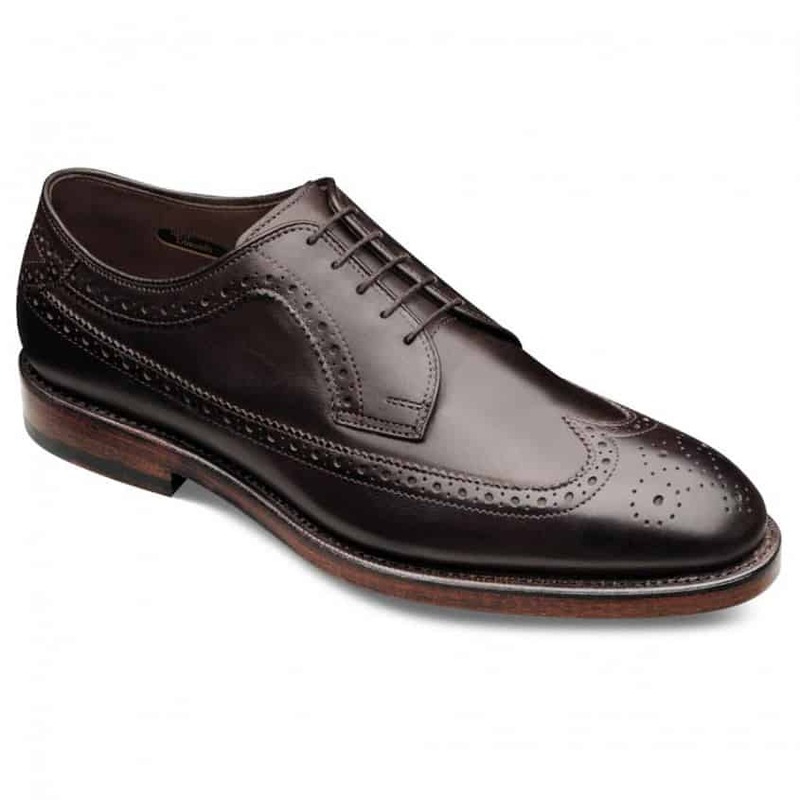 Sometimes they are referred to as ‘English brogues’ in the US and as ‘American brogues’ in the UK. 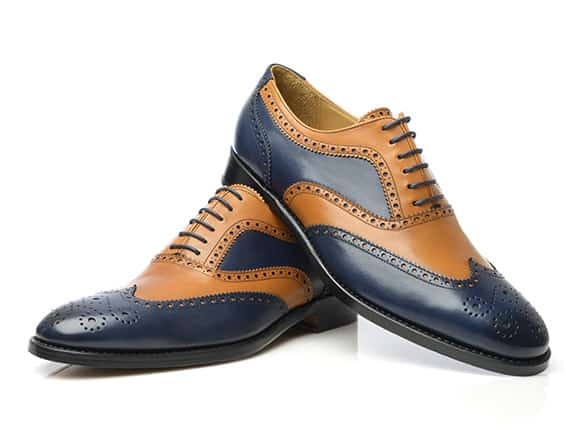 Most of the time longwing brogues are made as a derby but oxford longwing brogues exist. Wingtip toe cap without any broguing (either along the edge of the toe cap or in its center) is called an austerity brogue even though technically it cannot be called a brogue due to the complete absence of any broguing. 2. 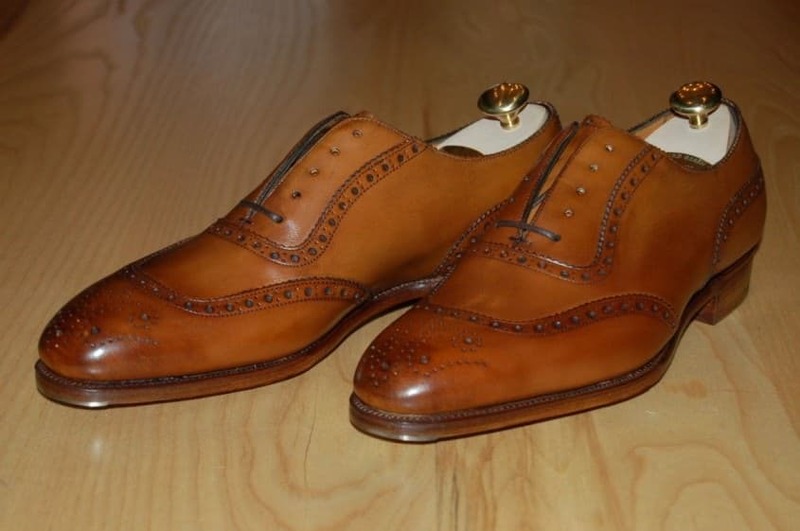 Semi or Half brogues – these have a toe cap without extensions or wings and feature broguing both along the cap’s edge and sides and have a medallion. 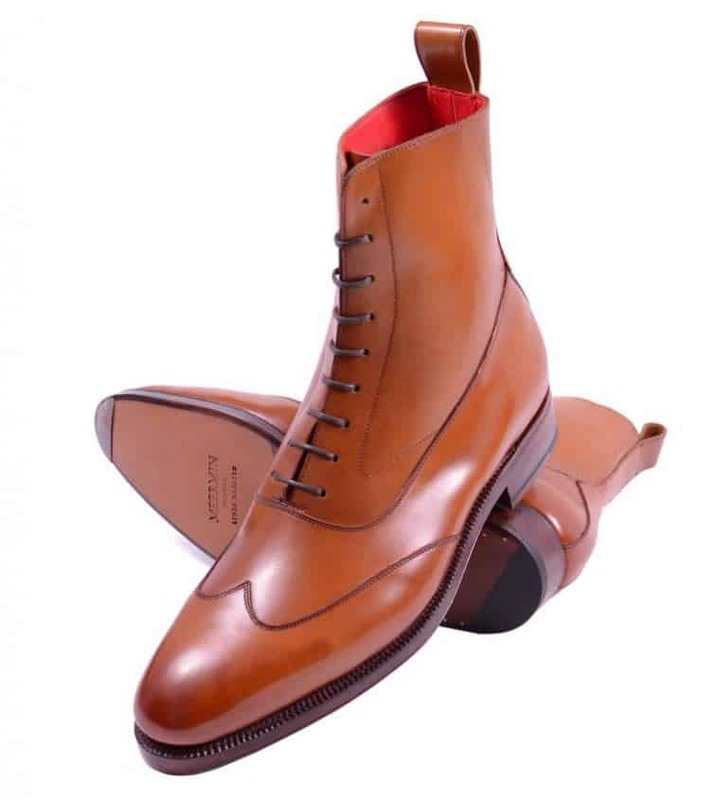 This style was first designed by the famous London shoemakers John Lobb Ltd in 1937. Today, you will find many variations of the semi brogue, including V cap, cap without medallion, and a second, recessed piece of brogued leather behind the cap. 3. Quarter brogues – like the semi or half brogues these have toe caps without points and without extensions or wings. However, they differ from the semi or half brogues in that they have broguing only along the caps edge and not anywhere else and feature no medallion. 4. Ghillie brogues – the standard style for traditional formal Scottish dress footwear (including evening dress in black) is a Full brogue or wingtip but differs from them in that they do not have a tongue and have long laces that that wrap around the legs above the ankle and are tied below the calf. 5. 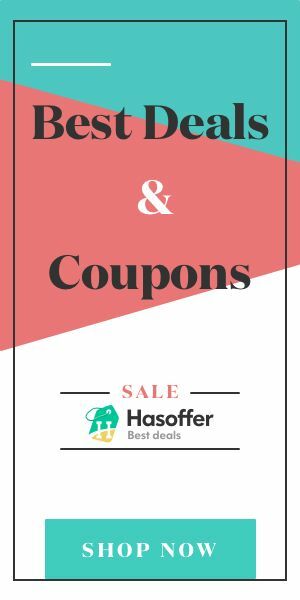 Modern variations – of course you will find all kinds of modifications of these classic styles. 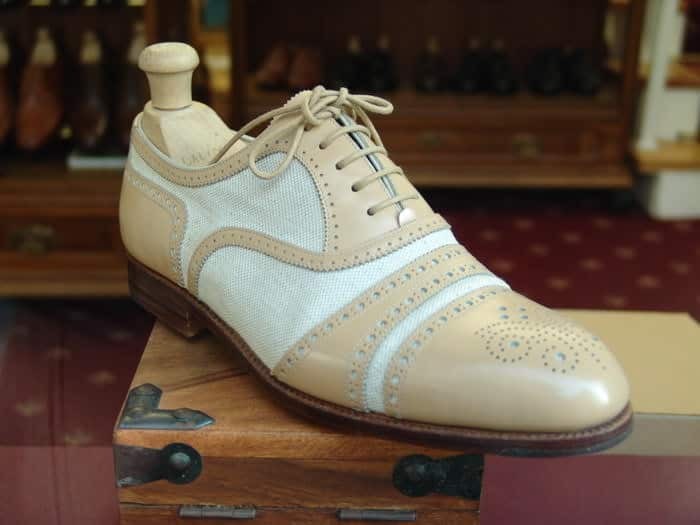 One of the more popular variations is the U-cap or U-tip which is a an adaptation of a full brogue. 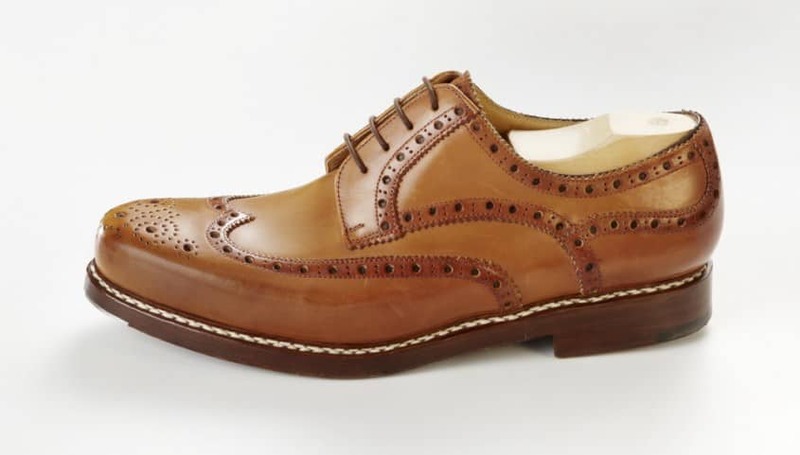 Brogues also feature a variety of closure styles or lacing systems, however, these are not defining characteristics of a brogue except in the case of the Ghillie brogue. 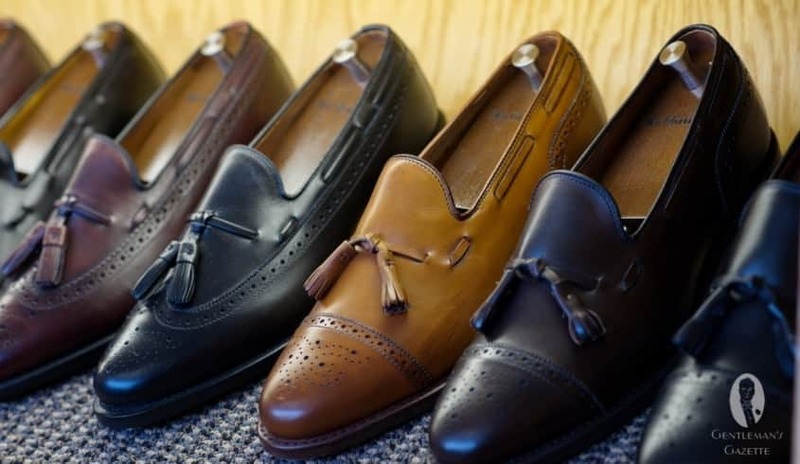 Some of the common closure styles available are laced Oxfords (closed lacing system) , Derby (open lacing system), Monk straps (both double and single), slip on system (with or without elastic), loafers, and even boots (with or without laces). Brogues were originally designed for outdoor wear and were worn by the working class predominantly in Scotland and Ireland. Slowly over time they were used by country gentlemen as an outdoor country walking shoe. It is because of these very roots that they were not considered appropriate wear for other social or business occasions during that time. However, things changed in the twentieth century when the brogue was used as a template for fashionable women’s footwear. The perforations or broguing were now used solely for decorative purposes. Famous celebrity women such as the actresses Marlene Dietrich and Katherine Hepburn incorporated it into their signature style of daring masculine fashion choices. The model Twiggy also favoured the shoe, reportedly made by George Cleverly after she challenged him to design her pair of flat shoes. All this led to a rise in its popularity. Due to this influence, perceptions began to change and slowly the brogue began to be considered appropriate wear, even for men for most occasions both social and business. By the 1920’s, brogues were extremely popular with men, especially in the United States but also in England and continental Europe the brogue was now an integral part of one’s show wardrobe. 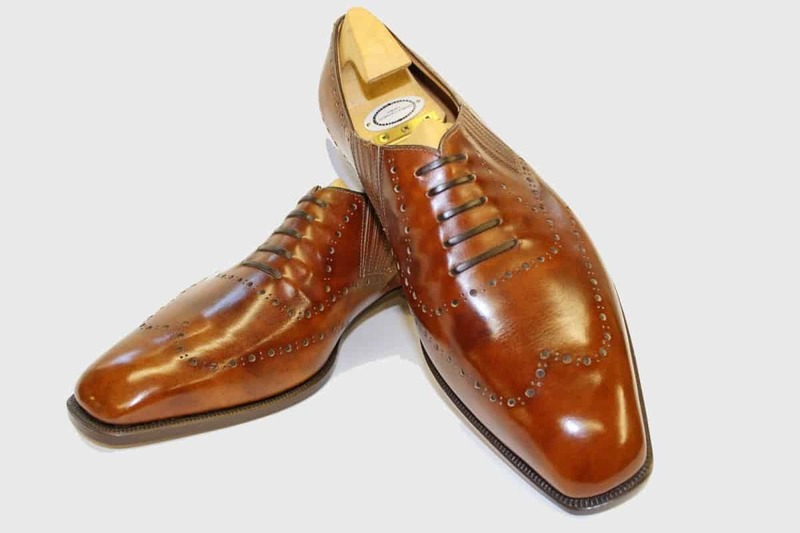 Famous men like Fred Astaire, Gary Cooper, or Cary Grant all brogue shoes regularly. Even today, a full brogue would formally not be considered the proper shoe to wear with a three piece pin-stripe suit, whereas a quarter brogue in black or oxblood makes for a perfect business shoes. As a rule of thumb, always bear in mind that a shoes is less formal the more broguing it has and vice versa. 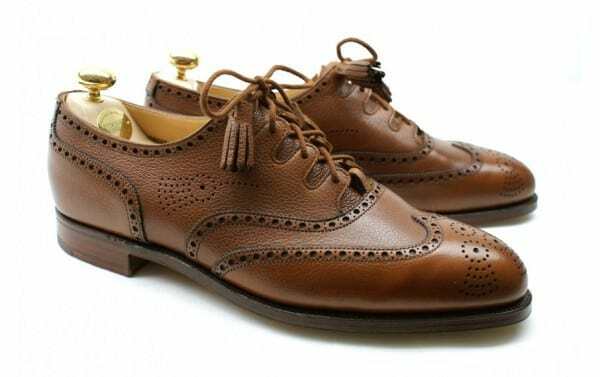 As such, full brogues are perfect when combined with anything related to country attire, and semi brogues in a darker brown color are very versatile and can be worn with tweed as well as casual worsted sport coats and brown suits. Even though Prince William committed this faux pas, brogues are never appropriate for Black Tie or white tie events, unless you wear black ghillie brogues the Scottish Highland dress and I’d also shy away to wear them with dark three piece business suits. When worn as a dress shoe with a suit, it is better to opt for either half brogues or quarter brogues as they are not too elaborate and maintain the formality of the outfit. 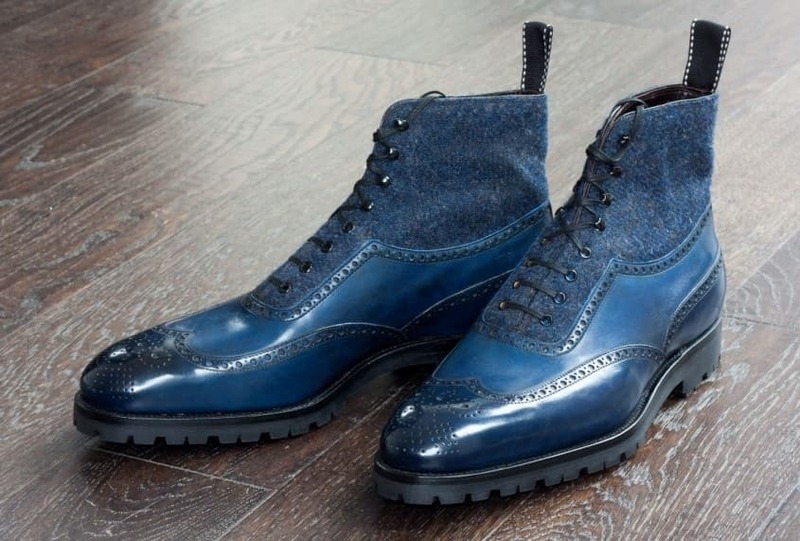 A full brogue is mostly too casual for a worsted suit but will work with tweed or other country fabrics. On other semi – formal occasions where a suit is not required and where a blazer or a sports coat will suffice the wingtip or muted spectator makes for an ideal choice. It maintains just the right amount of formality and casualness. 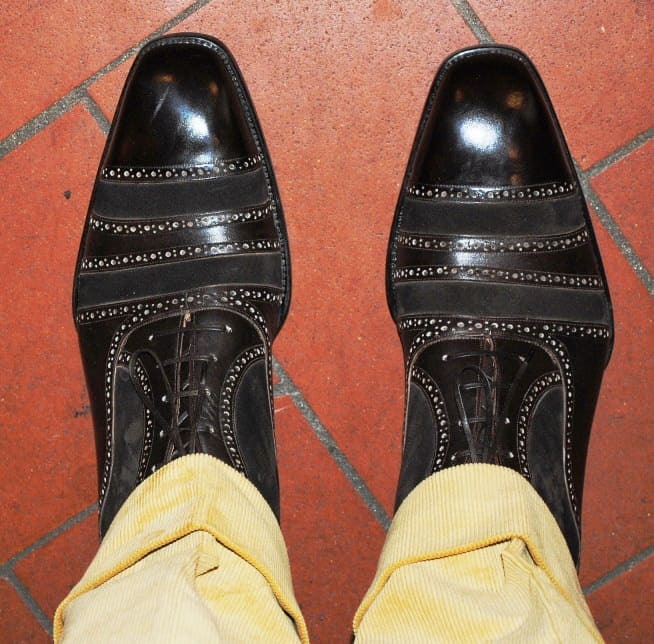 In a casual setting the brogue can be paired with jeans, chinos, and most other casual trousers. 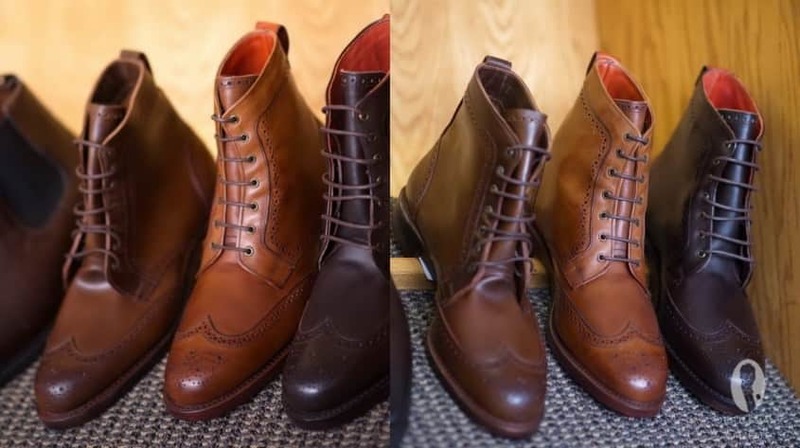 Brogues come in a variety of colors with the classic colors being brown and black. Of course, there are endless shades of brown but personally I also like oxblood very much and even navy or dark green will work well as brogues. And these are the safe choices when it comes to wearing them for formal occasions. Spectator shoes are not everybody’s cup of tea and can be difficult to pull off. 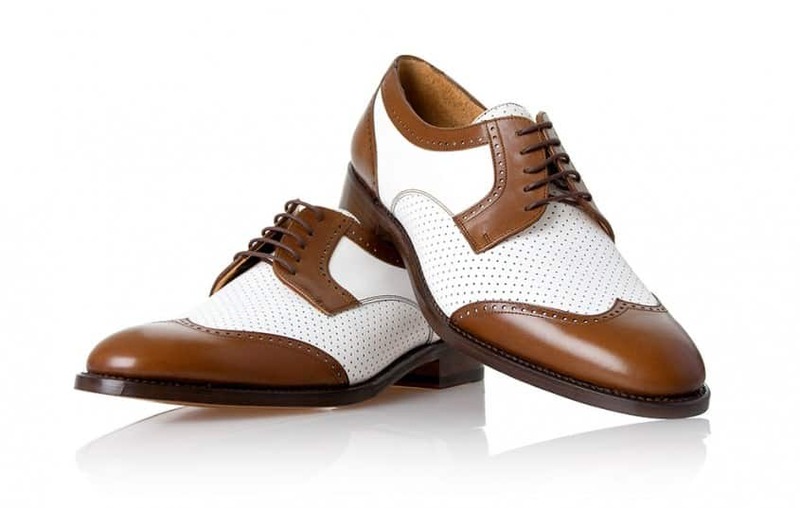 I like to pair my brown white spectators with light colored or brown trousers while others prefer to wear them on the golf course only. If you have confidence in your style you can wear them anywhere you want – except for formal occasions of course. While most brogues are made of boxcalf leather, they are available in suede, scotch grain, and all kinds of other leathers. Ideally you should opt for smooth or at least uniform leathers to make the broguing shine. 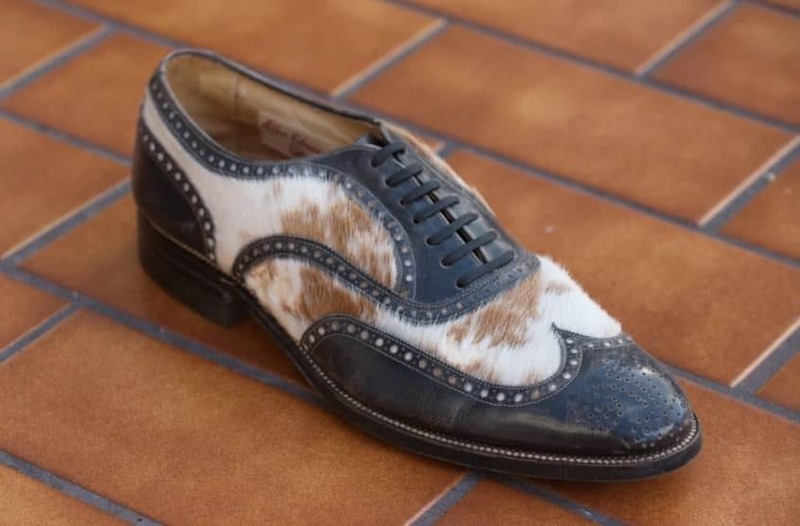 For example ostrich brogues or stingray are so dominant that a brogue shoe would look simply horrid. 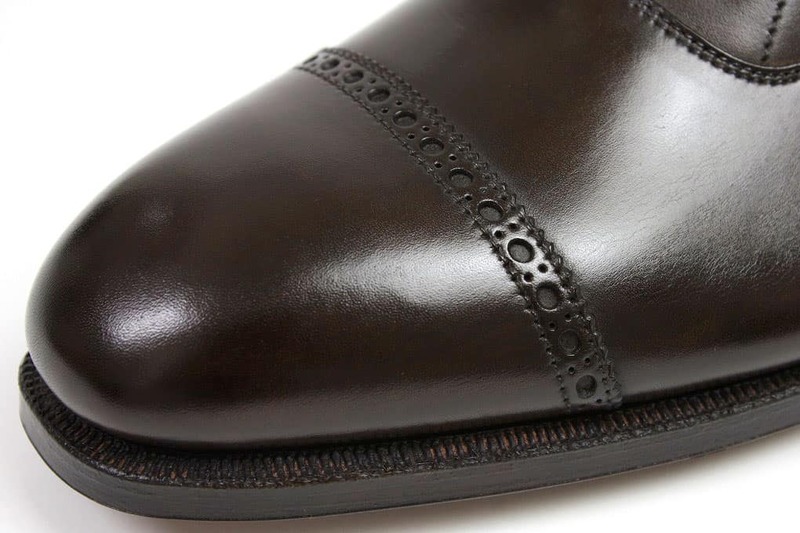 Most brogues you see will be the traditional kind of regular or symmetrical hole perforations. 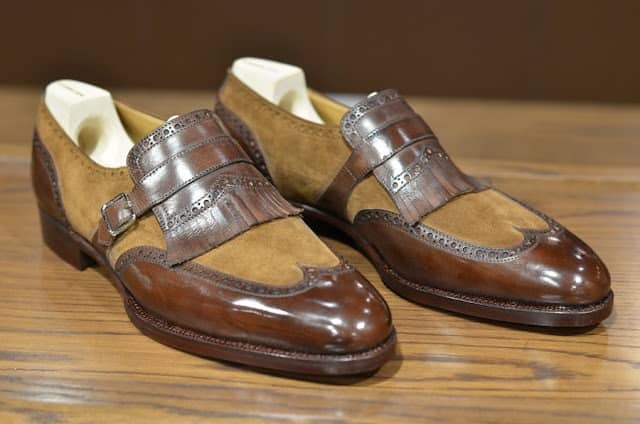 However, in recent years I have also seen more creative broguing such as shotgun or buck shot brogues that look a bit like somebody fired a shotgun onto the leather. So, if you are more inclined to go fashion forward this could be an interesting way to combine the classic look. While I have seen some men wear brogues with shorts, I have to confess that I am not a fan of this look at all. For me brogues work especially well with Blazers, Hacking Jackets, sports coats, casual suits in lighter colors and tweed or even a Harrington jacket.